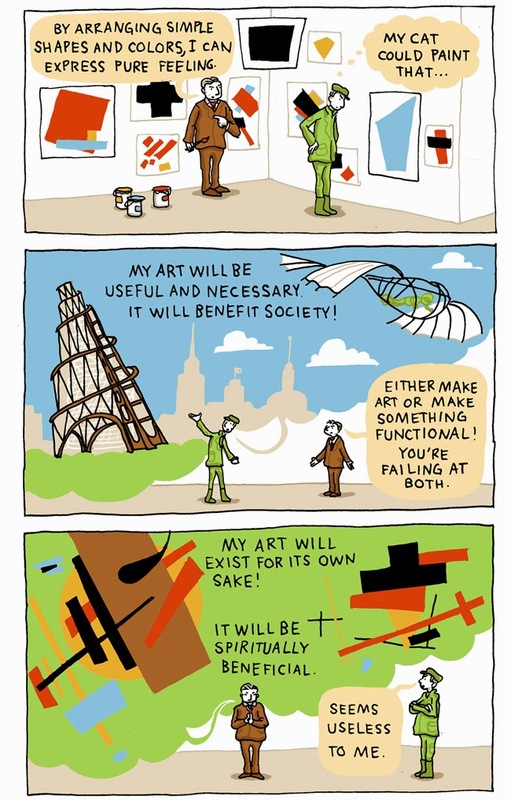 This comic first appeared in my series "Who Needs Art?" for Medium.com - check out the original post for some of the history behind the feud between Tatlin and Malevich. 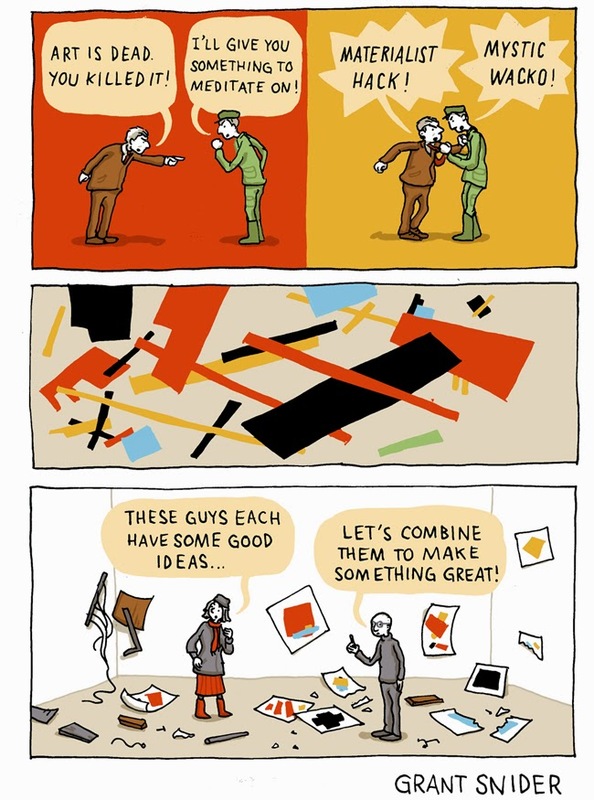 This comic could also be called "Constructivist vs. Suprematist." I think Constructivism was a fascinating movement, but I'm partial to the geometric energy of Suprematism. The last panel alludes to the Russian artists who combined the language of both movements in their work. One of my favorite examples is A Story of Two Squares by El Lissitzky, a remarkable children's book that advocates Constructivist principles of cultural progress through Suprematist shapes and colors. I grew up with older brothers who would argue like cat and dog. 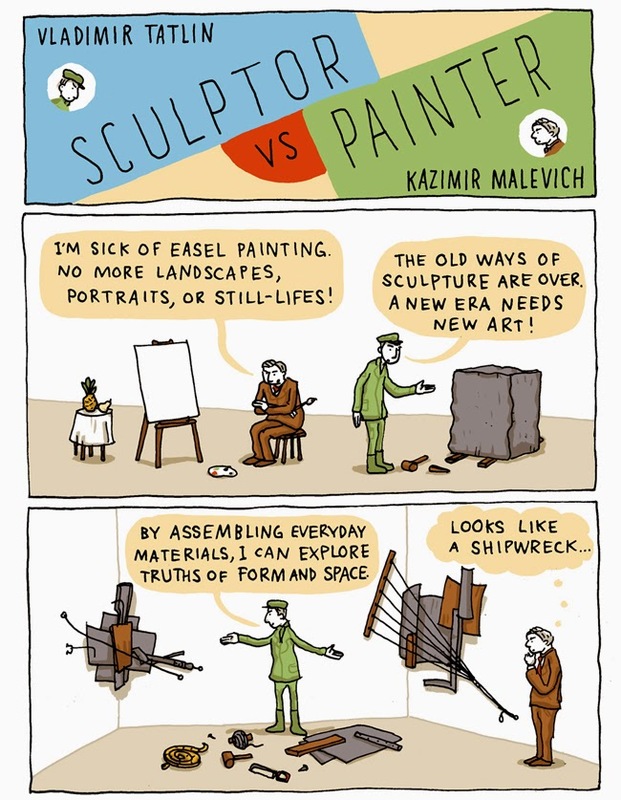 One is a sculptor and one a painter. This describes their dynamic PERFECTLY. Genius. Isn't this always the way with art? Creative people will always find ways to create. Nicely done. Always enjoyable and thought provoking. You know, I have always dug Malevich, but something about El Lissitzky engages me on a much deeper level. The line "Either mark art, or make something functional! You're failing at both." takes me back to my years at art school. Good times. Grant, as a senior librarian i'm very gratefull to, via your lovely and inteligent comics, have been introduced to El Lissitzky. Thanks, once more.